It's time for The Paper Shelter Challenge, and the theme is "Harvest Time- Use Orange, Green, Yellow and Brown". 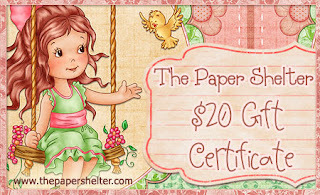 If you enter the challenge and you used a Paper Shelter image, and you are randomly selected in the drawing, you could win a $20.00 gift certificate to spend in The Paper Shelter shop. If your creation is randomly selected, but you did not use a Paper Shelter image, you could still win your choice of one digi image from The Paper Shelter shop. Isn't that great!? That means that everyone can play! This cute image is "Halloween Spirit" colored with Copics, then cut with a Spellbinders Floral Accent die. The patterned paper is also from The Paper Shelter - "Gothic Girl" digital paper pack. The swirls were cut with one of newest addtions to my die collection, Memory Box's Elegant Scrollwork, rhinestones and fringe trim were from my stash. A perfect card as per usual Shari. Can't wait to meet your new member of your family. Hope all is well. So cute, thanks for playing along with us at CCCB! Adorable card with a super sweet image! I love the trims you added to the card too. Thank you for playing along with Flutter By Wednesdays! I really like the comment you pasted on your card. love how you added the swirls and bling here!!! great card!!! thanks so much for playing along at the City Crafter challenge blog!!!! This is so darn cute.. Thanks so much for playing along with us at CCCB! Sweet and LOVELY! Thanks so much for joining in this week at CCCB! My goodness... this is so darling... the fairy is just the cutest!! !